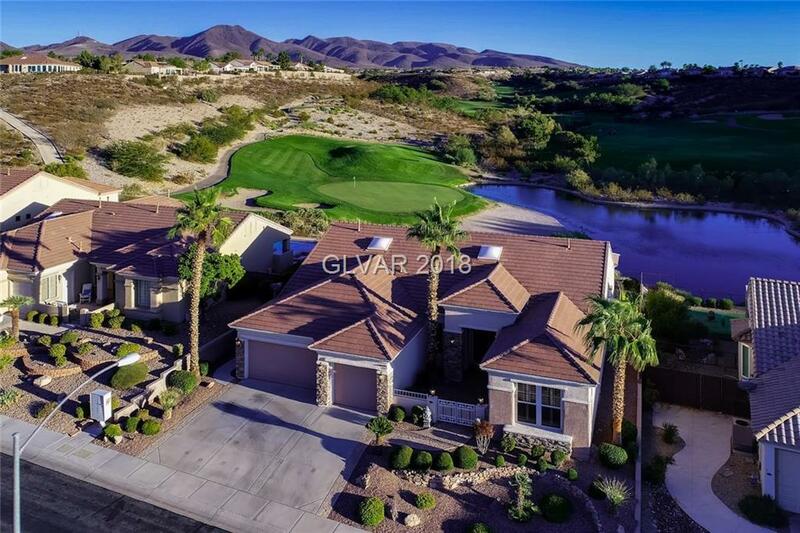 PEACEFUL & TRANQUIL, with BREATHTAKING VIEWS of ANTHEM REVERE'S GOLF COURSE. The entire back side of the home has a panoramic view through the 40' ft. Great Rooms oversized windows, of DOUBLE FAIRWAY with a GREEN, LAKE and SANDY BEACH. The "GOLD KEY" CUSTOMIZATION FREATURES include: expanded Living Area, Kitchen Breakfast Bar, 18" Tile, 10' Coffered Ceilings, Recessed Lights, Ceiling Fans and a Gorgeous HAND CRAFTED built in Entertainment Center. Directions: From St. Rose & Eastern, Go South On Eastern. Right At Fork To Sun City Anthem Drive West. Left On Preston Park Dr. For .2 Mi. To Somerset Springs Dr. Home Is On Right.